Sichan Siv shares his personal story about how he escaped the Khmer Rouge and became a Cambodian Killing Fields survivor. He has written an international best selling book entitled Golden Bones and has even worked side-by-side with the President of the United States of America. He talks about why he loves the US and much more on today’s show. 2:40 – Sichan was working with George Bush senior 13 years after escaping the killing fields. 8:40 – Sichan considers himself very lucky and blessed for these opportunities. 11:20 – George H.W. Bush was the most altruistic person Sichan ever met. 13:20 – Sichan talks about the time he was captured by the Khmer Rouge. 16:30 – Golden State is Sichan’s most recent book. 20:50 – The founder fathers talking about the future of the United States is Sichan’s favorite historical moment. 25:00 – You can not find a place like the US anywhere else in the world. 26:20 – We need to hold our government accountable to keep America beautiful. 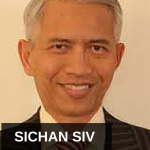 It’s my pleasure to welcome Sichan Siv to the show. He is a former Deputy Assistant Secretary of State, former Ambassador to the United Nations Economic and Social Council under President George W. Bush, former Deputy Assistant to President George H.W. Bush, former US Ambassador to the United Nations. Author of the New York Times Best Selling book Golden Bones: An extraordinary Journey from Hell in Cambodia to a Life Nife in America. Sichan, welcome, how are you? I’m doing very well. Thank you, Jason. Thank you for having me on your show. Well, the pleasure is all ours and you’re coming to us from New York City, is that correct? That’s correct and it’s very cold here. Stay warm. At least you’re inside now. You’ve got an incredible resume, an incredible background. I want to talk to you about your experience maybe in government first and then talk about the Golden Bones book and your amazing and, I’m sure, horrific experience that you’ll share with us about that experience, but you know, as a White House adviser and being involved in these different political positions, tell us about your experience with government and what you saw there just kind of generally if you would. Well, it is a special privilege for me and remains very special privilege all of my life to have worked for the President of the United States, especially George H.W Bush. When I walked in to work at the White House on February the 13th, 1989, it was exactly 13 years from the day I jumped off a truck in western Cambodia to escape the killing fields of the Khmer Rouge. So, there is no place in the world, Jason, where somebody was able to make it from the killing fields to the top job where the President of the country is working in 13 years. That can happen only in America. So, there I was sitting at the White House working for the President of the United States. 13 after I escape from the killing fields and I saw history taking shape in front of my eyes. You may remember that this was 25 years ago. You’re probably referring to the Soviet Union collapse, I assume? Exactly. You took the words out of my mouth. Under George H.W. Bush the cold war ended and like you just said, the Soviet Union fell apart. Eastern Europe became free. The Berlin wall came down, Germany became united. So, there I was, a former refugee from the killing fields of Cambodia, sitting there, working for the President of the United States and seeing history parading in front of my eyes. That was quite astounding to say the least. So, I can not be thankful enough for the opportunity to live the American dream that George H.W. Bush gave me. As I mentioned, this could have happened only in America. The White House is a place where you are exposed to both politics and policies. So, everything that you are doing for the President of the United States can affect a lot of people’s lives. So, you feel a lot of, quite a heavy burden of responsibility, so that’s one aspect of my public service. The other one, when I was at United Nation when George W. Bush appointed me to be an Ambassador to the UN. It’s a very special place for us, because we co-founded the United Nations. We played host to the UN. New York is the world’s largest diplomatic community and, at the same time, we are the largest, in fact to many United Nation’s programs. Everything from (#5:14?) from children to aging and everything in between, human rights, HIV, food crisis, human issues. We are there at the top. We are doing this not to be popular, we’re doing this because it’s our duty to honor our country, because we are passionate for society. This time I walked in, my colleagues from 191 countries looked at me and through me they saw you, they saw America, but strength, a greatness, a goodness of future. Each time, we’re pronounced on behalf of the President and people of the United States that was my proudest moment. Right, wow. That’s amazing. Your journey is nothing short of incredible and it really speaks to the amazing level of socioeconomic mobility in America. I mean, the fact that, you know, 13 years before you walked into the White House to be the Deputy Assistance Secretary of State. I mean, not exactly a small position, okay. You were jumping off a truck to escape the killing fields of Cambodia. How long after jumping off that truck did you arrive to the United States? I mean, you were a political refugee, right? In 1976 on June 4th, 1976 , one month before the bicentennial I arrived in Connecticut with my mother’s scarf an empty rice pack and $2 dollars. I was sick and tired. Exhausted, but I was full of hope. I wanted to adopt myself to America, so that America would adopt me. To be adopted. So, I picked apples in Connecticut and then I went to New York to drive a taxi. I applied to a number of schools. They all turned me down because I had no transcript except for Columbia. Columbia gave me a full scholarship. I did a masters of international affairs. I worked in Wall Street and a few other places, and then I was suddenly interested in American politics, in the mouth of education, just to educate me how it works. My whole family in Connecticut told me if I wanted to understand America, I should get involved, so my chance to get involved in 1988 when George H.W Bush, Vice President Bush, ran for President. So, I volunteered in his campaign. I did everything they asked me to do from licking envelopes to making phone calls. In those days there was no email, so we made hundreds and hundreds of phone calls and when he got elected he asked me to go and work for him at the White House. So, this is quite unusual, Jason, because there’s hundreds and thousands of people who volunteered in the Presidential campaign, but I was among the lucky few. So, what do you attribute that to? I mean, it’s gotta be more than just luck. You certainly worked hard, you did everything, you got yourself adapted so that you could be adopted to American culture pretty well, it’s more than luck, right? That’s true, Jason. It’s a combination of everything you just said, but my wife, Martha, she used to say that sometime you have to create your own luck. I worked hard in the campaign. I wanted to understand how the process works, but at the same time, I got to know some people in the transition team and they were looking for something of my background at the right time. My resume arrived at the right time and they were looking for somebody of my background. Somebody who can speak a few languages, somebody who knows international relations, and there I was. So, it’s a combine nation of luck and faith, in a sense, but when you get it you have to preform as well and I was lucky, I was honor to serve with the 41st President. Yeah, fascinating. Did you find, I’ve got to ask you like the insiders guide to government and I know there are some things you certainly can’t say, but did you find there was a lot of corruption in government, for example. You were in Wall Street before that, so maybe compared to Wall Street it looked pretty clean. Not in the Bush White House, Jason, because President Bush made sure his White House, his organization at the highest ethnically standard and if you look at it there was hardly a scandal in the entire 4 years of George H.W. Bush administration and that is because he lend by example. I’ve been privileged to travel to over 100 countries. I’ve been able to interact with a lot of cultures around the world and I’ve been able to interact with people of all kinds of backgrounds from top to bottom, the poorest, the riches, the strongest, the weakest, the powerful, and so on and so forth, and I had to say that George Bush is the most altruistic person I’ve ever met in my life. He thinks of all the people before he thinks of himself. When you say that, you worked for both George Bushes, so you’re talking about the first one, the father? Yes, I was talking about George Bush father, because I worked for him at the White House, so I saw him quite regularly. I’m thinking of one story that I am always reminded of when he was younger when he played, he got a good game, he’d come home and he told his mother, I did this, I did that, I said this and did that, and his mother said, So, George, how about your team? I think that sort of instilled in him the spirit of thinking of others and he is that kind of person and he lend by example and I can not thank him enough for letting me live the American dream. Making it from the killing fields to the White House in 13 years. Tell us about how you escaped. You said you jumped off a truck, what happened after that? Tell us about that. We are curious. I was working for CARE, which is a legal organization in 1975 and I was to be a-listed out of Cambodia, but I missed the helicopter location by 30 minutes, because I went to meet with the (#12:15?) providence, there are from 3,000 refugees stranded in (#12:20? ), so I missed the US evacuation by 30 minutes and 5 days later the generals came in and they turned our country upside down. They killed people who wore glasses, sign of education, they killed teachers, nurses, business people, government officials, military personnel, they killed anybody who had not been with them, the Khmer revolution. So, I threw away my glasses, I pretended to know nothing, hear nothing, to speak of nothing and my mother gave me her wedding ring, scarf, and a bag of rice, and she told me to run and never give up hope. So, I rode a bicycle for three weeks across Cambodia. I use straight passes and false excuses to get through the check points, security check points, and then I was captured near Thailand. They tied my arms behind my back. They were going to kill me, because they suspected I tried to cross the border, which was actually my intention. So, a truck driver saved my life. He told the Khmer Rouge I was an innocent person and that I was looking for my family. So, for the next ten years I was put in forced labor camps, I was given bowl of rancid soup per day to eat. At night, I never knew if I was going to be alive by the following morning. When I woke up, I said I’d make it to freedom. So, in February the 13th, 1976, I was alone at the back of a timber truck. So, I just jumped off and I went running, walking, crawling, swimming for three days, having nothing to eat or drink, I fell in a booby trap, I was severally wounded, but I arrived in Thailand completely exhausted. Wow, wow. So, Thailand took you in and when you say you jump off the truck, that was part of the labor camp. That truck, right? That’s part of the labor camp, because I, in 76, they were looking for a crane operator and I knew that the job would take me closer to Thailand, because they were going to use a crane to pick up timber along the Thai border and I never been in a crane in my life, so I raised my hand. I just raised my hand and I said that I was a crane operator. So, at night I burned some old candles and I pulled a blanket over my head and I began to study instructions. So, they provided you with the instructions to operate the crane, right? No, no. I found it in the crane. That fact along would have cost me the life. I know, they would have killed you if they found out you were lying, right? That’s right. If I were caught reading and reading something in English that would have been the end of me. You mentioned that before with the people with the glasses. They would kill people with glasses. They were just intimated by people with any sort of education or knowledge, I guess? That’s correct. They don’t want any educated people. They found it was easy for them to terrorize the country, to brain wash us. They could control the non-educated people, but the educated people wouldn’t let it happen, yeah. Exactly. They wanted to control people. What an incredible, incredible story. So, you told the story about when you arrived to the US you drove a taxi and you moved right up from there. Amazing. Incredible. Incredible story. So, the whole thing is summarized in this booked called Golden Bones, as you mentioned, and then just recently I published another book called Golden State: Love and Conflict in Hostile Lands. That is a fiction. It’s not a political thriller. As you say, it’s faction, right? That’s correct. It’s a faction. A fiction based on facts, yeah. So, why the title Golden Bones, though? And then, I want to ask you about Golden State, but what’s the title for? Golden? What does that mean? Golden Bones. In Cambodia, the people call somebody who is blessed and very lucky, a person of golden bones, and when I travel around and I tell my Cambodians, we are all people of golden bones, because they’re very lucky. They are blessed to be living in America. So, that’s why those two words are used through the title of my main one, Golden Bones, because I am very lucky, I am very blessed. Golden State, as I mentioned, it’s a fiction, a faction. A fiction based on facts. It took place in the future and it took place in the country in west Africa, which is a former French colony and the name of the country in French is Lit-Ta-Dor, which in English is Golden State. This fictitious country is full of natural resources, so China, Russia, are trying to get a hold of it, but the French, which is a former colonial power tries to save it and then it came to the United States, because one of the principle characters used to be a teenage used to do mission work, church mission work in that country. So, you have friends of former political power and China, Russia, and then the United States, because of this person who was a young missionary, a young church volunteer in that country where he met the President of France who used to be a former diplomat there. So, it’s all sort of interconnected, but there are a lot of powerful women in that story. Although it takes place in the future, there are still a lot of corruption, a lot of crimes, a lot of injustice, but in the end it is love that prevails all. Sure, sure. I wanna ask you to bring this up to, you know, to the current times we are living in, not in the future, not in the past, but with your, drawing on your past experience in government, the first thing I wanna ask you about it is, you know, you are wonderfully grateful to be in America and the whole original intent and the idea of America is such a great, great story. It’s been such a beacon of freedom for so many people around the world, but these are tough times we are in. People are very divided, people are complaining constantly. I know they were doing this in the past, this is not new, of course, but, to me, it seems worse nowadays. What’s wrong with our country, if you wanna say anything is wrong with it. What do we need to do nowadays to fix it, I mean, we’re in deep, deep debt, but we still seem to be kind of getting away with that since we’ve got the reserve currency and the biggest military and the biggest economy, but I don’t know, some day, don’t we have to pay all this debt back to the various countries to which we owe it? Well, the fundamentals of how countries..the very foundation of the United States is very strong. I mean, it’s no other countries in the world that have this kind of foundation. I mean, my favorite history period is the 18th century, you know, the founding fathers they’re discussing on now that we have the United States, what do we do with it? And they paid debt so and so forth. If you look at those periods, I mean, those are just 200 some years away and there was nothing, there was no national bank, central bank, there was no army, there was nothing, and the people were able to get together and fought for independence and fill a mission that is now the world’s oldest demography that has sustained a lot of crisis. Be it war, be it help other countries around the world, we are never a conquering power, we transform the ashes of Europe and Japan into parliament and prosperity. Give funds to earthquakes and tsunamis, we help improve tariff and education of women and children. We are there to support the people around the world and we are doing this not to be popular. You know, we’re doing this because we are Americans, because we are a compassionate society. So, I have faith, I have faith in America. Yes, there are problems all the time and I see it as a statement. A statement that will disappear in the rear view mirror soon enough, but I believe in the goodness of the American people. So, do you think though that our government has lost that vision? It feels that way to me a lot of the times, but on balance I wanna say, you know, I host a show called the Jet Setter show, which is profiles people that talks about expat living, investing overseas and so forth, and I gotta say, a lot of people that I interview have this, like, irrational, and they’re Americans, oddly, and they usually live in America, but they’re promoting that people live else where, but they live in America themselves. You know, they’re not following their own advice, which I find interesting and they have this irrational fear and hatred of America. You know, they talk about the Patriot Act and all this stuff and the NSA and, listen, I agree with all of that. I hate that stuff. I think our government is becoming too intrusive, but compared to what? I mean, what do they wanna do? Move to Belize? I’ve been to Belize a couple of times and I interviewed John McAfee, the software former billionaire guy, McAfee security software, and he lived in Belize for awhile and he couldn’t stand it! I mean, he just thought it was terrible. You have no rights. I mean, where around the world do you really have any rights except Europe and America, of course, there are other ones in any advance country, but it’s just, I don’t know, I think it’s a pretty special idea, you know, I really do. I’m not saying that just because I happen to be lucky and, you know, I happened to hold American citizenship. I mean, I’ve been to 74 countries. I’ve looked. I’ve considered moving overseas, you know, the thought still crosses my mind once in a while, but it’s a pretty special place. It’s very special, Jason, and I would say it’s even unique. It’s not a place in the world that comes close to America. I don’t want to argue with you, but I’ve been to 115 countries, every continent in the world, and I’ve learned from all these countries that I’ve seen and it’s hardly a place anywhere on this planet that can come close to America and now when you mentioned Belize, I mean, if you’re a scuba diver, you can, of course, learn the reef, but if not, how much can you enjoy more than a few dives, that’s it, but here, I enjoy traveling around the country. I enjoy being in the mountain states, the coastal states, and anything in between. I enjoy interacting with high school students, business people, professional, and so on and so forth. I’ll be speaking in the George Bush Presidential library on April 16 and before that I’ll speak to the daughters of the American revolution and a few other places and it gives me a lot of energy to share the American dream with them and also to remind them, especially young people, you are so lucky, you are so blessed. We are all very lucky, we are all very blessed, so don’t take a different blanket and that’s my perception People realize that, oh my goodness, we are really living in a very special place. There’s nothing close to America. So, all of that said and we agree on that, I think though that’s one of the reason that all of us really have a duty to be forever vigilant about keeping it open and transparent as much as we possibly can and holding our government accountable, because it is really the last best hope. There are certainly things that are opening up around the world and things that are closing up, you know, in the middle east it’s pretty scary what’s going on, still, the US, it’s a pretty special place and I think it’s important that people don’t become complacent and think it’s just gonna stay that way automatically, right? We’ve gotta speak up, we gotta hold our government accountable. When the government oversteps its bounds, we’ve gotta be vocal about that. I agree with you. I agree with you. Keep being active in the political arena. Well, good stuff. Well, thank you so much in joining us today. Give us your website if you will and tell people where they can find the book and learn more about you and your incredible, incredible journey. Yes, my website is www.SichanSiv.com. So, that’s SichanSiv.com. Well, thank you again so much for joining us and please keep getting the word out about your journey and your appreciation for everything we’ve got here. We’ve got a lot to be grateful for. So, thanks for joining us. Thank you, Jason. Thank you for having me on the program.